Product #15516 | SKU JAM 96K-L | 0.0 (no ratings yet) Thanks for your rating! 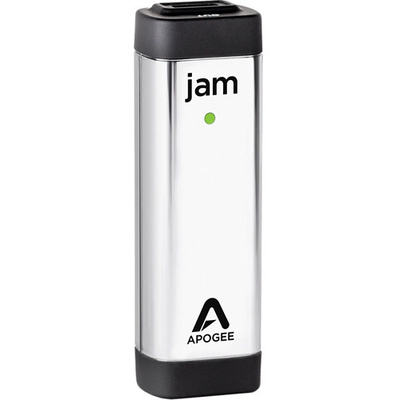 The JAM 96k Guitar Interface for iOS and Mac from Apogee Electronics is a compact instrument interface capable of capturing audio in up to 96kHz/24-bit resolution for your compatible iOS device or Mac computer. It features a 1/4" instrument input that can be used with electric guitar, bass, or acoustic instruments with a pickup. The circuit design of the JAM 96k emulates a tube amp tone, providing a warm sonic quality for your instruments. The interface has plug-and-play operation, and is powered by your iOS device or Mac, thus requiring no batteries or external power source. Designed to work with GarageBand and Logic Pro, the JAM 96k will also work with any Core Audio compatible application on either your iOS device or Mac. You can monitor your levels with the multicolour LED. Lightning, 30-pin, and USB cables are included.